Vlahos is a Washington, D.C-based writer and contributing editor at The American Conservative magazine. She said today: “Many are lecturing about what being a ‘conservative’ means. Certainly there are tensions between people who identify as intellectual conservatives and a Donald Trump, who is appealing to public anger and populist tendencies. “But people who profess to be ‘intellectual conservatives’ — who may cite Edmund Burke when it’s convenient to do so — frequently don’t abide by rather clear conservative principles when that gets in the way of prevailing agendas. There’s nothing conservative about warmongering. There’s nothing conservative in the classical sense about the government eavesdropping into your private communications while exercising secrecy for itself. That’s not conservative. That’s not small government, that’s tyranny. 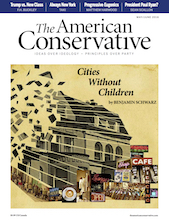 “Classical conservatism fully embraces the free market. But government actions — including those backed by Democrats as well as Republicans — like subsidies to various industries, distort the free market. Certainly, bailing out Wall Street firms — which Paul Ryan and other leaders of the Republican establishment backed — is not abiding by the free market. Such individuals are in no position to be offering lectures. “Certainly, political terms largely mean what people say they mean. There are clearly schisms between the Republican blue bloods and people who have identified with the Tea Party.